In response to the GCAS, labor and community organizations plan to march and rally in San Francisco on September 8 — to Rise for Climate, Jobs, and Justice — to “send a message to the Summit, our government, and the world that the time for half-measures and false solutions is over.” The S.F. demonstration is the anchor event for similar actions taking place that week across the country and around the world. 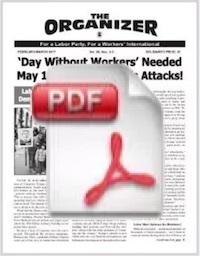 Socialist Organizer, the political organization that publishes The Organizer newspaper, has prepared this 8-page Special Supplement as a contribution to the discussion on how to defend the environment and humanity, two questions that in our view cannot and should not be separated. Humanity is today facing an unprecedented crisis caused by the impasse of the capitalist system based on the private ownership of the means of production. The crisis has a specific environmental component that is intertwined with the general crisis affecting working people the world over, and this ecological crisis can only be dismissed or downplayed at humanity’s great peril. The environmental crisis has already real and tragic consequences for millions of humans today. Problems such as the recent oil spills in China and the Gulf Coast; smog choking the inhabitants of big cities; deforestation; chemically unhealthy mass food production; the pollution of our lands, rivers and oceans; and climate change, all have dire consequences for human civilization. The future of the planet — and, therefore, human civilization — is correctly understood to be at stake by millions of people, particularly among the younger generation. In recent years, under the impact of the deepening ecological and social crisis, the desire to “save the environment” has caught the imagination of many young workers and students who, via this prism, have begun to question features of the capitalist system and its constant drive for profits, which is at the root of world’s current crisis. Millions of youth understand there is something wrong with the current economic system but have not developed a class or socialist understanding of the problem. For Marxists, “saving the environment” means ending capitalism’s irrational and super-polluting practices in order to defend and improve the lives of the billions of human beings inhabiting planet earth. Unfortunately, too much of this sentiment has been channeled into anti-industry, anti-consumption, anti-worker perspectives pushed by NGOs and their more “Left” counterparts. In Germany, to cite one example, the Green Party, in power with the Social Democrats, proposed a plan to rid Germany of non-carbon nuclear energy and replace it with … 23 coal plants burning dirty brown coal, not exactly a solution to the potential dangers of nuclear power. The Green parties globally and their environmentalist non-profits and NGO allies are totally wedded to the fake “Green capitalism” that everywhere supports the destruction of jobs and public services and provides no long-term solution to the environmental destruction wrought on the planet by capitalism. Socialist Organizer puts forward a political perspective to win youth and others concerned with the environment to the scientific and political perspective that the expansion, not destruction, of the productive forces, for human needs and not for profit, is the only solution for humanity. We explain that such development can and must take place in an ecologically viable manner. The central transitional slogan in relation to capitalism’s assault on the environment and humanity is the call for the nationalization of transportation and the energy industry under workers’ democratic control, raising in turn the need for a planned economy and authentic workers’ governments. Without such nationalizations and democratic worker-community control, it will be virtually impossible to make a turn towards cleaner forms of energy generation in the interest of the masses of working people. The only social force capable of successfully leading to victory in the fight against the devastation of the environment caused by decaying capitalism is the organized working class in alliance with the youth and all the oppressed. Capitalism, in its final imperialist stage, is leading humanity to barbarism — and possible extinction as a species. To defend humanity it is necessary to end capitalism’s destructive use of natural resources and establish a rational use of them for the immediate and long-term benefit of human civilization. These two questions — the defense of the environment and the defense of humanity — are inextricably linked; they cannot and should not be separated. Given the widespread lack of awareness concerning the rich writings of Karl Marx and Frederick Engels concerning the relationship of humanity, capitalism, and the environment, it is useful here to summarize this little-known history, which forms the foundation of a Marxist position today on how to confront the ecological crisis. Marx and Engels wrote at a moment when the industrial revolution was leading to a massive wave of pollution and industrial contamination wherever factories, refineries and other advanced forms of production developed. The working class in this period, the period before unionization, faced terrible environmental conditions, leading to widespread disease and early death. Whole cities were kept in perpetual fogs of smog; it was dangerous even to go to work or school. Marx often described the interaction between human society and the natural world as a kind of “metabolism.” He argued that the destructive irrationality of capitalist production creates a “metabolic rift” — a sharp break in the relationship — between humanity and the planet. “The moral of the tale is that the capitalist system runs counter to a rational agriculture, or that a rational agriculture is incompatible with the capitalist system (even if the latter promotes technical development in agriculture) and needs either small farmers working for themselves or the control of associated producers.” (Karl Marx, Capital, Volume 3, p. 216). “As individual capitalists are engaged in production and exchange for the sake of the immediate profit, only the nearest, most immediate results must first be taken into account. As long as the individual manufacturer or merchant sells a manufactured or purchased commodity with the usual coveted profit, he is satisfied and does not concern himself with what afterwards becomes of the commodity and its purchasers. The same thing applies to the natural effects of the same actions. Clearly, the environmental crisis has deepened tremendously since the era of Marx and Engels. The catastrophic threat posed by global warming is just one part of the overall environmental crisis created by class society’s inability to rationally regulate its relationship to nature. Capitalism in the age of imperialism has reached the stage where the acceleration of the “destructive forces” of humanity is becoming more and more the salient feature of the system based on the private ownership of the means of production. Look at the example of coal. The United States still generates 49.75% of its electricity from coal. According to the Environmental Protection Agency over 21,000 people in the U.S. die each year as a direct result from inhaling coal ash in the form of microscopic particulate. Additionally, over 20 times that number develop respiratory ailments from coal burning: asthma, emphysema and respiratory related heart disease. These numbers exclude the number of U.S. coal miners who are hurt, injured, or who develop black lung disease as a result of their jobs. Coal, which also contains a variety of heavy metals from thorium to uranium to mercury, is the largest source of these carcinogens in the environment today. To give an idea how bad coal is in terms of pollution, over 400,000 people die each year from coal related deaths in China. Perhaps 10 times that number develops various illnesses from it, as most Chinese cities are enveloped in clouds of pollution. And, of course, as is well know, coal remains a central contributor to climate change. Pollution is not an abstract moral question — it is, and always has been, one that effects the direct immediate well-being of the working class. In the United States, it disproportionally effects the most oppressed among the working class, particularly Black and Latino communities. The agricultural sector, including food production, also illuminates the irrationality of capitalism. Enormous “dead zones” caused by nutrient runoff, such as that in the Gulf of Mexico, groundwater contamination through pesticides, huge loss of genetic biodiversity because of crop monoculture, deforestation and the loss of habitats, and the erosion of scarce top-soil all make agricultural production a key topic in an analysis of current environmental problems. In particular, as socialists, agriculture represents a key juncture between the problems facing the environment and the problems facing the working class — all of the conditions of modern agriculture that make it detrimental to the environment also contribute to exploitive and dangerous working conditions for farmworkers and food processors, as well as the dispossession of resources from rural communities throughout the world. The fact that a significant shift towards ecologically sound production has not already taken place demonstrates the complete irrationality of the capitalist system, which puts profit above all other considerations. The technological potential for a rapid transition to an economy that does not destroy the environment and promote global warming already exists. While acknowledging that renewable or non-carbon-based energy sources also may pose certain environmental risis that will need to be addressed as we move forward, preventing the rapidly developing ecological disaster of global warming requires a massive shift away from coal, oil, and natural gas, towards solar, wind, geothermal, hydro, wave, tide, nuclear and other energy-generation mechanisms that produce little or no carbon. Yet despite the tremendous existing technological potential and the repeated dire warnings from scientists, carbon emissions and generalized environmental devastation continue to grow every year on a worldwide level. So why hasn’t any meaningful action been taken in light of all the new “green” rhetoric of the governments and corporations? The answer lies in the nature of the capitalist system, which puts profits above all else. Moreover, transitioning to an ecologically sound economy poses a massive social re-organization — that is, a break from the anarchy of the private ownership of the means of production and towards a rational energy plan based on the nationalization of the energy companies and transportation under worker-community democratic control. Thus it is necessary for Marxists to expose all wings of the bosses and make clear the contradiction between their new supposed environmentalism and the reality of their practices, which are as polluting as ever. We cannot overstate the importance of this point. While we should take advantage of any divisions in the ruling class to push for our demands, any gains we make will be won by us, not given to us, through the class struggle. The fight to stop the destruction of the environment — just like the fight to stop layoffs, privatizations, racist attacks and all other blows against working people — can only be advanced and eventually won via the independent mobilization and organization of the working class and its allies against the small minority of exploiters who are running the world into the ground. Is Development Itself the Problem? We think, as Marxists, that the advance of human civilization was, and remains, dependent on the development of the productive forces – i.e., how humanity provides for itself and develops via the labor and technology it implements vis-a-vis the natural world. This process has progressively moved humanity from the drudgery of a primitive hunter-gatherer existence where small groups with extremely low life spans were under constant threat of starvation, death by disease or attacks by animals, to a moment in human history where the economic potential exists to meet the essential needs of all people on the planet, which would allow humanity to free itself from compulsory labor and move on to communism, what Engels called “the realm of freedom” and the real beginning of human history. It is crucial to reject the view that working people are “living beyond their means,” that workers “consume too much” and that, therefore, we have to return to the “ways of the past.” This vision is reactionary through and through — if implemented, it would mean a return to barbarism, with devastating consequences for literally billions of people. The environmental movement today is dominated largely, but not exclusively, by NGOs, many of which are directly connected to major sectors of the capitalist class. For instance, the Gates Foundation has partnered with Cargill and Monsanto to “help” Africa grow food, and the board of Acumen, a leading “social entrepreneurship” fund, is stocked with Wall Street elites. These groups, among dozens of others, have pushed the belief that the environmental problem lies with the human species itself: humans, as consumers, simply use too much (energy, commodities, etc). These very middle class and Western-based NGO environmental groups talk about humanity as whole, ignoring both the different realities of dominant and dominated countries, as well as the class (and racial) divisions within the dominant countries. Yet most people in the world — i.e., the populations in dominated countries in Asia, Africa, the Middle East, and Latin America — still do not have access to sufficient amounts of energy. Basic rights such as access to regular electricity, potable water, sufficient food, etc. are still denied to billions of people on this planet. Many in these NGOs praise the poverty of billions of human beings as something “noble”; they hold their lifestyles up as examples of “doing more with less.” Thus they oppose development, any development, in the imperialist countries and in the underdeveloped countries of Asia, Africa and Latin America. This sort of reactionary reasoning means explicit support for maintaining billions of human beings in conditions of disease and poverty. The fact remains that giving up on industrial civilization — including electricity, urbanization, etc. — could only mean a tremendous regression in the living standards of the vast majority of humans on our planet. These movements and NGOs have put forward reactionary proposals and should be exposed as such. Of course each group and movement needs to be judged specifically, but the overall trend of these groups is towards “de-development.” Our view, as Marxists, is that only the planned expansion of the productive forces on an ecologically sound basis can provide a future for both humanity and the natural environment. A future ecologically sound socialist society is still going to need very significant energy production. We will still need a lot of energy — at present well over 1.6 billion people on earth don’t even have access to electricity at all! Humanity will need more, not less, energy in order to address not only the issues of inequality between nations but to phase out fossil fuel energy production and usage. It is not a question of lowering consumption (and living standards), but of producing more to meet human needs, but on an environmentally sound basis. We reject the argument promoted by many environmental organizations that humanity should subordinate its immediate and long-term interests to the so-called higher priority of “the defense of the planet.” An isolated “nature” unaffected by humanity does not exist anywhere on earth. The environment today is completely intertwined with class society and it is impossible to separate the environmental crisis from the social crisis caused by the decaying capitalist system. Thus it is, at best, meaningless and, at worst, reactionary to counterpose “the defense of the planet” to the defense and development of humanity. They are inseparable. As part of this “degrowth” offensive, the bosses, the heads of government, the U.N., and their various political relays in the apparatuses of the “Left” and the “Far Left” are using the pretext of climate change to push (and/or accompany) layoffs, de-industrialization, and the destruction of the gains working people and all the oppressed have won through bitter struggle. The capitalist de-industrialization and de-growth policies make wide use of the “greening of the economy” terminology to destroy industry, jobs and all forms of productive forces. It is necessary to clearly oppose all such roundtables and “green industrial policies” that seek to use the global warming issue for reactionary purposes, with the help of all too many left activists. It is necessary to demand an end to all layoffs and the nationalization, retooling, and conversion of polluting industries under democratic worker-community control. The neo-corporatist agenda is aiming to co-opt the unions into the implementation of this de-growth and deindustrializing agenda. Against this offensive, it is more urgent than ever to promote class independence and expose all attempts to forge a “national unity consensus” meant to co-opt independent workers’ organizations. To the extent that the various “eco-socialist” currents do not challenge such corporatism and de-growth policies, they serve as “left cover” for, and are accomplices in, this reactionary drive. “The financial crisis of the auto corporations was not caused by the auto workers any more that the financial crisis of Wall Street was caused by the working class. … We strongly reject the administration’s drive to make the unions a partner in the effort to resolve the corporation’s financial crisis. The unions were not created by the workers to join the employers in their corporate assault on workers’ jobs. Likewise, the fight against capitalist pollution is integrally linked to the fight for oppressed nations, which are generally the most affected by environmental destruction, to regain national sovereignty via the re-nationalization of their natural resources. By taking back their natural resources from foreign companies (which generally impose irrational and unsustainable uses of the land and resources for the benefit of an export-oriented economy), dominated countries can advance their development and industrialization in a manner that benefits working people without decimating the environment. In all countries, the nationalization of energy resources is a central and key demand. At the same time, of course, it is necessary to oppose all attempts by imperialism, with the help of NGOs, to (re)assert its control over other country’s resources under the pretext of “green energy” (e.g., attempts by companies to privatize deserts for solar power, oceans for wave power, etc.). Imperialism remains imperialism, regardless of whether it chooses to garb itself in green colors. The fight for clean energy in a nationalized energy sector under democratic worker-community control is intrinsically linked to the fight to create literally tens of millions of new, good-paying, union jobs via massive government programs to build and install hundreds of thousands of solar panels and wind turbines, build widespread green public transport, properly insulate all homes and buildings, and undertake the thousands of other necessary projects to move towards a cleaner world. The funds currently paying for the bank bailouts, the foreign debt (in dominated countries), and wars should instead go towards these projects and other public services. The capitalist class, since the 1920s, has organized to destroy many urban area mass-transit systems in order to force workers to buy and use automobiles, which are now the cause of 40% of all greenhouse gas emissions. This has been a largely successful campaign, save for a few of the bigger cities east of the Mississippi River. Thus the extension of existing mass transportation systems — and the development of new ones like high-speed rail — are imperative to the lowering of pollution from cars and trucks to generally lowering the costs of transportation for workers to and from their place of work. Such a huge and not-particularly financially profitable undertaking for the benefit of humanity and its environment can only be won through an independent mass movement centered around the demand that the governments establish a massive jobs program. The Trade Union group of the Campaign Against Climate Change, which is currently leading such a campaign in Britain, estimates that it would take the creation of at least 1 million to 2 million new jobs within 10 years to stabilize greenhouse gas emissions in Britain. On a world level, this would mean the creation of 100 million to 200 million jobs. The capitalists and degrowthers are using the pretext of climate change to push layoffs and de-industrialization. This, of course, must be opposed. In all countries, we must continue to build a movement to demand “No Cuts! No Layoffs!” and, moreover, call for the government to prohibit them. The demand for “No Layoffs!” is not at all inherently contradictory with the struggle against environmental destruction and global warming. In fact, the opposite is true. 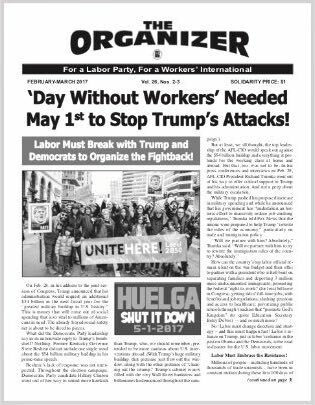 At a moment when unemployment is skyrocketing across the world, and while awareness is increasing among working people about the tremendous dangers of global warming, a campaign to fight for these green jobs in a nationalized energy industry, with democratic worker-community control, would be important. We demand that the jobs created by new clean nationalized energy plants be first of all offered to workers who are currently employed in highly polluting industries. In this way, steps toward cleaner energy production can be made without supporting or adapting to the efforts of the capitalists to lay off workers and de-industrialize. This approach is correct tactically in that it avoids the trap of attacking workers in super-polluting industries and avoids playing into the hands of the capitalists who are using the pretext of climate change to shut down plants. 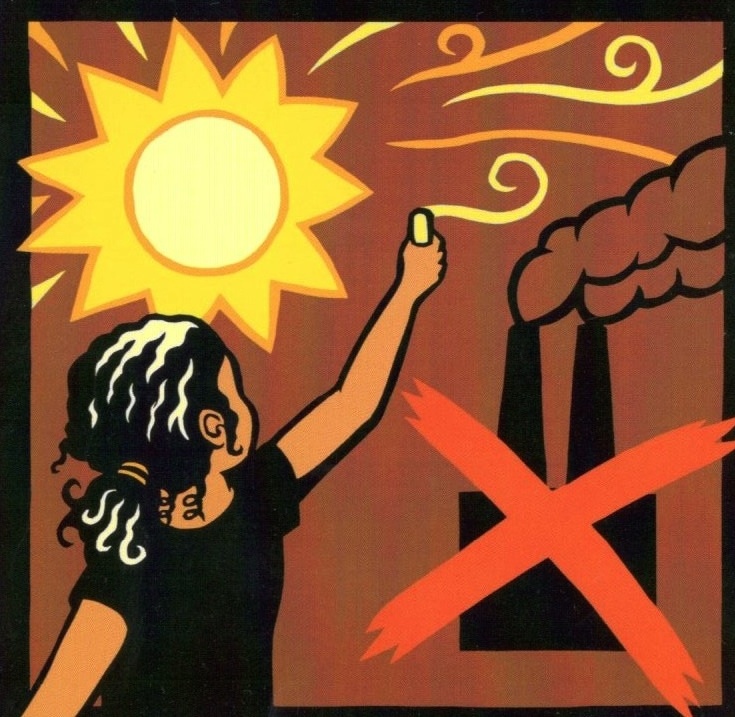 During the shift to a cleaner energy grid under nationalized energy production, there will be a transition period when oil, coal, and gas will have to be phased out until that point where the newer and cleaner energy industries can provide for all the developing needs of society and provide alternative jobs for all workers. The approach of calling to build new cleaner energy production is also correct because the central energy question in both imperialist and dominated countries is whether new energy production should be based on fossil fuels or on non-carbon energy generation techniques (solar, wind, nuclear, etc.). It is necessary to stress this important point. In the progressive fight of dominated countries to industrialize and develop, there is no pre-ordained reason that they have to adopt the irrational and destructive reliance on fossil fuels of the imperialist countries. Trotsky explained through his theory of uneven and combined development that “backwards” countries can “skip over” some of the stages of development of more “advanced” capitalist countries. By refusing to pay the foreign debt, these countries would have the resources to provide for their energy growing needs through massive nationalized public energy projects based on the most modern technology, creating tens of millions of new jobs. In the imperialist countries, the question of what new energy facilities to build is also a central question because much of the energy infrastructure is very old. For example, in the United States, the median coal plant was built in January 1966. Due to the regular life-cycle of these plants, many have begun to be shut down in recent years, and many more are set to be “retired” in the near future. A major energy debate in the United States has been: What should replace these dying coal plants? The answer of the huge private energy corporations has been clear: new coal plants! For our part, we say: The government should nationalize the energy companies and begin building better and cleaner forms of producing energy for the benefit of working people! Our approach toward the dirtiest energy industries in some ways parallels the traditional socialist demand within imperialist countries for the huge military industrial-complex (which employs literally millions of workers in the United States) to be used for the benefit of humanity, instead of corporate profits. Calls on the government to stop all layoffs and to nationalize the energy companies and the transportation industry and to establish a massive public works environmental jobs program — all under the democratic control of the working class and the communities of the oppressed — are transitional demands, in that no capitalist government could fully implement either of them. Therefore, the fight to win these demands tends to point the working class and its allies towards the need to conquer economic and political power through the establishment of a workers’ (and peasants’) government. With this method we can more effectively help the masses of working people and youth overcome all obstacles in their fight for socialism, i.e., a classless society of super-abundance, based on the massive (and ecologically rational) development of the productive forces. Only the world socialist revolution — the abolition of the private ownership of the major means of production — can open up a real solution for all of humanity, as well as the environment.